Promenade Park01621 856503work ParkThe 100 year old Edwardian Promenade park encompasses an ornamental lake, a large water Splash Park, beach huts for hire, sandpits, a galleon play ship and aerial zip-wire and several picnic areas. The park hosts numerous events and affords magnificent river views over the Blackwater which means that it is an extremely popular park with over 300,000 visitors a year. The park was opened in 1895 to provide the people of Maldon with a valuable amenity. 'The Prom' as it is known locally, is a great place to walk or sit and watch the activity on the river and always makes for a great family day out. 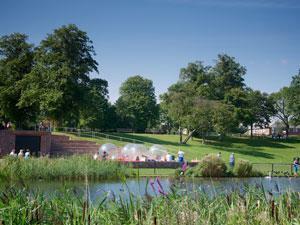 An ornamental lake with fountains, wildlife, seating and an adjoining sand play area. An amphitheatre and open air stage suitable for hosting theatrical productions and concerts. A splash park open from late spring through to the autumn dependant on weather conditions. A children’s play area, a play galleon and aerial runway and two large sand pits. A lake for model boating and crabbing. Riverside walk offering views of the estuary and its abundant wildlife. Beach huts which can be hired and dedicated picnic areas with picnic tables. Six separate retail outlets for refreshments and other merchandise. Formal gardens with a pergola, shrub borders, an Anglia in Bloom award winning drought garden, three dimensional carpet bedding displays, and many floral borders. Sports pitches (football, cricket, tennis courts, netball and basketball) and changing rooms. Skateboarding and BMX areas, demonstration wildlife garden and toddler water and sand play area. Three separate toilet blocks, including disabled facilities. The 100 year old Edwardian Promenade park encompasses an ornamental lake, a large water Splash Park, beach huts for hire, sandpits, a galleon play ship and aerial zip-wire and several picnic areas. The park hosts numerous events and affords magnificent river views over the Blackwater which means that it is an extremely popular park with over 300,000 visitors a year. Car parking (pay and display), designated disabled parking spaces, a coach park and drop off point. Admission to the park is free though some facilities, such as the Splash Park, are chargeable. Pay and display coach and car parking charges apply. Sat 29 Jun Essex Alfresco Cinema presents Mama Mia!